We have just reached the very end of a long list of Jewish holidays. We went through RoshHaShana (the Jewish New Year), Yom Kippur, Sukkot (the holiday of the huts) and now finally we have reached Simchat Torah. Simhat Torah literally means to “Rejoice in the Torah”. The Torah is the first five books in the Jewish Bible. It is sometimes called the Pentateuch by Christians which means “five scrolls”. The rest of the Jewish Bible is made out of the stories of the prophets (Nevi'im) and the writings (Ketuvim). The T of Torah, N of Nevi'im and the K of Ketuvim give us the Tanakh. 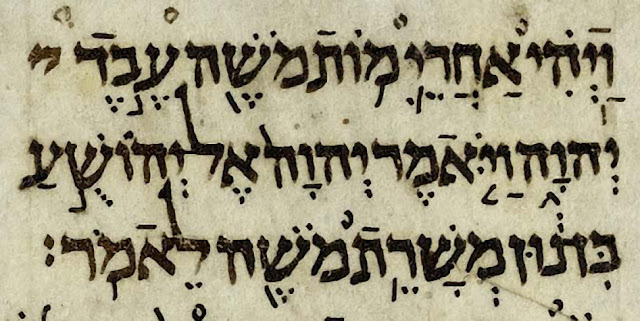 The Tanakh is known to Christians as the Old Testament. The five books of the Torah - Genesis, Exodus, Leviticus, Numbers, and Deuteronomy are known in Hebrew by the first word in every book. It is believed that Moses wrote these five books but lately different authors have been suggested. What is special about the Torah is that these five books are still written today in the form of a scroll. An experienced scribe copies the words by hand with a quill on the parchment of a kosher animal. 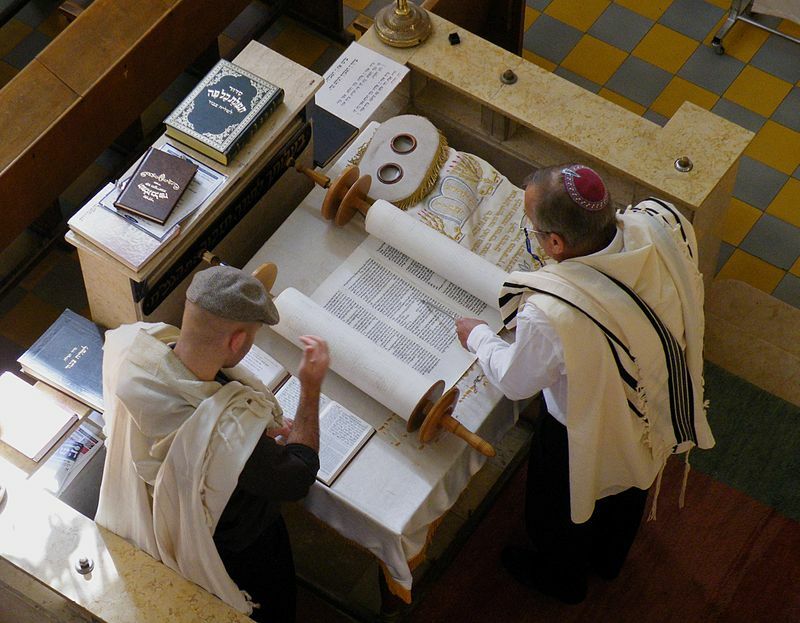 Writing a new Torah scroll is quite an undertaking. The scribe has to know how to write ancient calligraphy, make the special ink and quill, prepare the parchments and then do the actual writing, without making even one mistake. The photo below shows a section from the Aleppo Codex of the bible book Joshua 1:1. Just look at how straight the letters are written! Once all the parchments have been written, they are the stitched together with thread made of animal veins and attached to wooden rollers. These amazing scrolls are usually housed in a synagogue in a special ornamental cupboard known as an ark. The ark is placed on the wall that faces Jerusalem. On a usual week, the Torah is taken from the ark and read out loud on Monday, Thursday, and twice on Shabbat. The five books of the Torah are divided up in 54 segments called ‘parshiot”. Every week a different portion, or parshah is read until the entire scroll is read through throughout the year. Some portions are read together in the years that are not a leap year. The size of the sections are not equal, they can be anything between 30 to 150 verses long. Jews all over the world read the same parsha every week. So it doesn’t matter if you are in Tel Aviv, Madrid or Australia, you will know exactly which portion should be read. Today, on Simchat Torah day, the last verses of Deuteronomy is read and then immediately the first verses of Genesis are read. It is a huge celebration when the readings of the year is completed. People are dancing and singing, eating and drinking. As many people as possible are given the Torah to hold and dance with. (Not women or children though). I once asked a religious Jewish woman why women are not allowed to dance with the Torah. Until today I am not 100% sure if I agree with her answer. She said that it is enough for women to see men dancing with the Torah. Given the heavy weight of the scroll and the repercussion of letting it fall - I am personally okay with only letting the men dance with the scroll. What I really like about Simhat Torah is that the connects the body and mind. The happiness of coming to the end of a long year of reading and study spills out into joyous dancing. We do not just live in our minds but also in our bodies. And sometimes, when you are really happy, you just have to DANCE!! If you'd like to receive my occasional "Letter from Israel" in your email box, how about signing up at the box in the top-right corner. I am a fierce hater of spam myself and I promise that I only send out these emails VERY occasionally - though I really should be a bit less lazy.